It’s been said that homeownership is one of the best ways to build wealth — but do homebuyers really understand the asset they have acquired and how it can be used to increase wealth or relieve financial pressure? This is the question that popped into the head of Nicole Hamilton, an employee at a New York data analytics company, as she contemplated her own mortgage and home equity situation a few years ago. “I had a refinancing challenge and thought, ‘Why is this so hard?’” Hamilton said. “During the housing boom, a lot of people got loans they couldn’t afford. 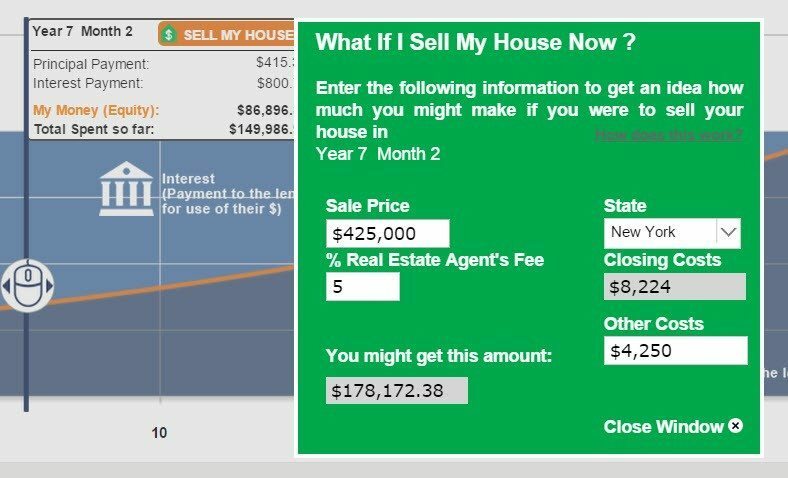 The result was Tactile Finance, a Web-based technology company that provides homeowners with a “360-degree view” of their mortgages, as well as the ability to create and compare different financial scenarios, such as selling or refinancing, to determine which best suits their financial goals. While Hamilton, the new company’s CEO, thought it was a problem that would be easily solved, she discovered it was a long process, particularly when it came to building the technical side of the service. “But I learned through this process that the secret to having control of a good outcome was really simple: It was all about the loan, the total cost of it, and how a person builds equity, now and in the future,” Hamilton said. There are many forms of “loan calculators” out there for consumers to use to estimate monthly payments and interest rates, but comparing overall benefits across different loan types and properties is nearly impossible, Hamilton notes. Most existing calculators fail to take into account differences in loan type details, insurance costs, amortization schedules, lender and nonlender fees, and quotes that may be confusing to some potential buyers. With Tactile Finance’s tools, customers get a complete picture of home financing options by inputting the home’s details. 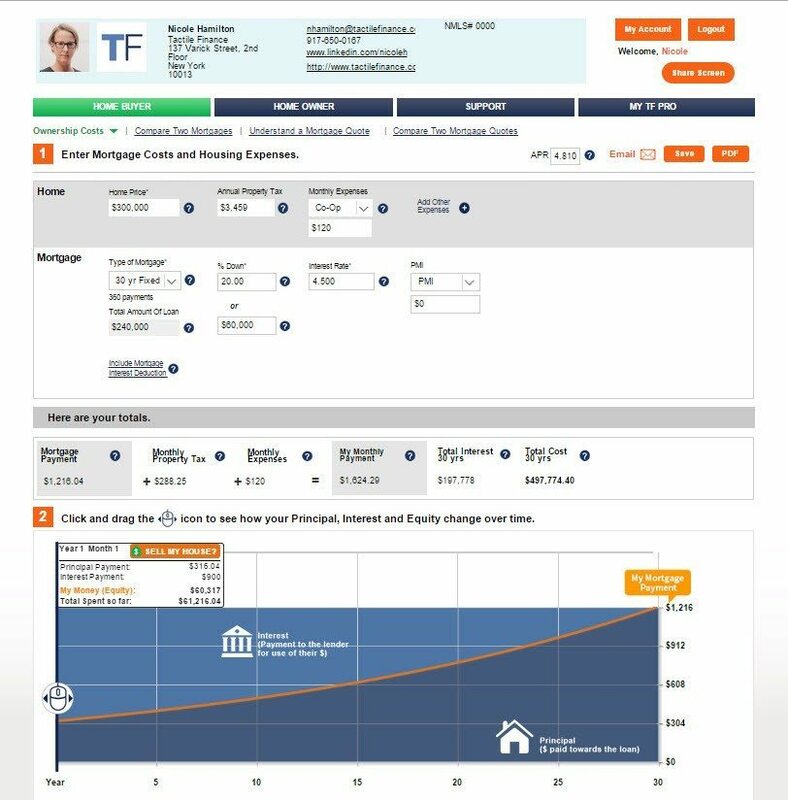 The tool then lets clients toggle through multiple financing scenarios for any number of properties. Homeowners can calculate their costs and savings if they choose to sell their homes or refinance their mortgages at any time, and define exactly what fees they can expect to encounter in any scenario, including some they may forget about or not realize will be involved in their transaction, such as appraisal or settlement fees. Scenarios are depicted in a dynamic bar graph that highlights any expected changes. Tactile Finance is also used by more than 30 real estate companies, including mortgage lenders, loan officers and real estate brokers. Tactile Finance will present at Realogy’s FWD Innovation conference for real estate executives on June 23 in San Francisco. Hamilton will return to San Francisco the first week of August to speak at Inman Connect.